be a bit lighter than usual! - lineart colour depends on chara's overall colour palette ! *NEW** COMMISSIONS BY CRITTER (CLOSED)Please remember to read my T.O.S ! How to order a commission! Make sure to fill out the form below, and send it to me in a note/twitter DM! COMMISSIONS - CLOSEDHello everyone! Here is my updated commission information, it will be updated periodically! Any questions or special commissions, please comment on this journal or note me directly. Click on thumb for more information! Sitting pose with character in sketch + shaded color with patterned background and washi tape detailing.
. : example : .
. : onesie : . $18/1800 POINTS KISS CUT CHIBBIES [CLOSED]These smol cute chibis are stress relief and "practice"! 2. when I accept, i'll give you link to pay! 3. multiple forms are OK! Final details are added to the design, hair is shaded and eyes rendered. 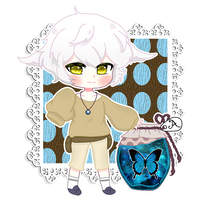 - Only opening cheebs for now! To-do list on my profile will be updated as I finish stuff. Basically, financial aid is rough and my family cannot afford to pay tuition, so I'm trying to help as much as I can with commission money. Prices are subject to change. PLEASE COMMENT BELOW TO BE ADDED TO THE WAITLIST!! >> human and kemonomimi only please!! Please read through my T.o.S. prior to ordering a commission! All orders are made through notes.